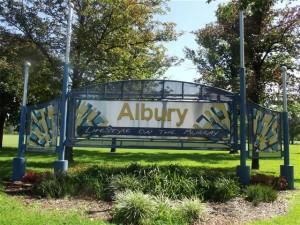 Albury, the second largest city in inland New South Wales, lies on the banks of the mighty Murray River, in the foothills of the Great Dividing Range, and on the border of Victoria. 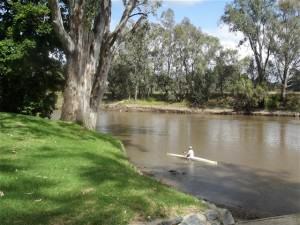 With its twin city of Wodonga it is a major regional centre and it simply begs to be explored! Steeped in history, Albury was one of the towns originally selected to be the capital of Australia. information centre. Well armed with brochures and pamphlets we left the centre and made our way to our accommodation. We’d chosen the Hume Inn ([star][star][star][star_half]) for our brief stay here. The Inn offers motel accommodation with breakfast included for a very good price. It was perfect for our stay. 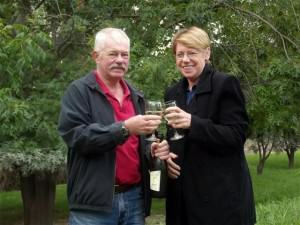 There are no real gardens at the Inn and so we wandered over to Australia Park for our first night bubbly with our bottle of Two Tails Sparkling Wine. It was quite pleasant at the park but when the sun started to go down so did the temperature and we returned to the Inn for dinner and an early night. It was windy and quite cold when we awoke the next morning but we weren’t about to let that stop us. We wandered down to the river, the magnificent Murray River and strolled along the banks watching a fellow in his canoe and thinking how cold he would be out there. We followed the Murray River Trail from the Mitta Mitta Canoe Club out to Noreuil Park and the mooring for the old paddlewheeler, PS Cumberoona. The old vessel has been, for a number of years, inoperable and badly in need of restoration. Albury City Council hopes to have the vessel returned to the water by the summer of 2015/2016. 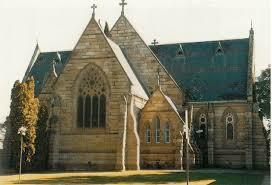 From there we wandered down Kiewa Street to the magnificent St Matthews Anglican Church. The original church was designed by Edmund Blackett, the designer of the University of Sydney and Sydney’s St Andrews Cathedral, and was built in 1857. The church was enlarged in 1876 and remained largely uncompleted until fire destroyed all but the stone walls in 1991. It was rebuilt to its former splendour and reconsecrated in 1994. Much of Blackett’s original design was included in the new structure. There are many heritage listed buildings in Albury and we decided to walk down to the railway station which has a history all of its own. It was constructed in 1882 by John Whitton, considered the Father of New South Wales Railways, and was 455 metres (1493 feet) long, at that time the longest in Australia. 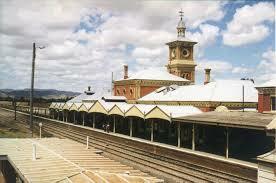 Victorian Railways used a broad gauge line and New South Wales Railways used the standard gauge line which meant that travelers in either direction had to change trains in Albury, thus necessitating an extremely long platform. This changing of trains continued until 1962 when the standard gauge line was extended to Melbourne in Victoria. Albury also boasts the second biggest regional airport in New South Wales but it is the racecourse that has some aviation history. In 1934 a Douglas DC-2 airliner of KLM made an emergency night landing on the racecourse after becoming lost in severe thunderstorms. After refueling the next day, local volunteers were able to help pull the stranded aircraft out of the mud and it was able to take off again and finished its flight to Melbourne. who so enjoyed the area called Ettamogah at Table Top that when he created the cartoon he used the named. The pub was built in 1987 and now houses the Ken Maynard Museum and Art Collection. 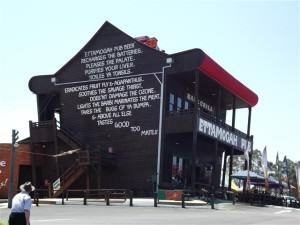 A chain of these pubs have been built throughout Australia. the lake and we went for a short walk but time wasn’t on our side today and I did want to visit the war memorial so we didn’t stay long. 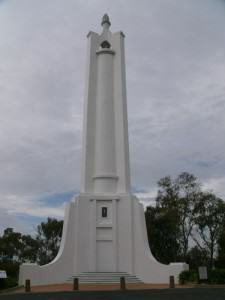 The First World War Memorial stands on Monument Hill and is the most visible landmark in the city. There are gardens around the memorial with individual plaques commemorating those who died in all conflicts where Australia has been involved. We strolled through the gardens for a while, read many of the plaques, and quietly reflected on how many conflicts there have been. A few notable Australians were born in Albury, including tennis champion Margaret Court, actors Richard Roxburgh and Maggie Kirkpatrick, V8 Supercar driver David Reynolds, fashion designer Lisa Ho, basketballer Lauren Jackson, and, of course, Ken Maynard. But Albury has also been the scene of one of Australia’s most famous crimes, the “Pyjama Girl Murder” in 1934. Identified 10 years later as Linda Agostini, there is now some evidence to suggest that she was not the Pyjama Girl and that Mrs. Agostini’s husband was wrongly accused and imprisoned. Sadly our visit here in Albury had come to an end and it was time to move on. We’d seen and experienced quite a bit here in only two short days but of all that we had seen and done there was one thing that stood out; there is still much to see and do in Albury. We’ll be back.